I’m thrilled to share this wonderful plan again this month from SwtBlessings.com. You can visit the author’s website by clicking here, and make sure you check out her Etsy store for some wonderful prayer cards to print out –there is a discount code at the bottom of this post! Click either image to open up a printer friendly version. The author of this wonderful Scripture Writing plan has an Etsy shop filled with encouraging items to encourage you to pray for your husband, wife, and children. 🙂 I have bought a few sets of these prayer cards and just love them. She is offering a discount code in her shop through February 14, 2016. All of the cards can be found HERE in her ETSY store. COUPON CODE: HAPPY for get 15% off your order. Thank you so much for providing the scripture writing plans. I love this new, directed way of studying during my quiet time. I have been following the plans each day since the first plan you published in December. The selected scriptures are so often just what I need for the day. 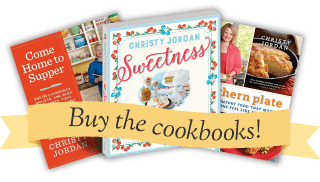 I love your blog posts, cookbooks and all of the recipes you share as well as all of the other helps and how-to’s you provide. Thank you for being a constant source of fun and information. God bless you–and keep up the good work! I would like to thank you for your Scripture Writing posts. I started using them with my kiddos over Christmas break, but my daughter and I have continued since then. My sons have Scriptures that they copy and memorize each week at school. My daughter has some mental retardation and is deaf, so I never really know how much she is actually understanding. She reads at a second grade level and loves to copy things, so, on a whim, I gave her a new notebook and the January list and she has been copying them when she is at school with me. She kept telling me last week that we need February’s list soon. I guess she likes it! I’m trusting that, even if she isn’t fully understanding what she is writing, she’s getting it into her somehow, since it IS Scripture. And I appreciate having a bite-sized portion of the Bible to focus on each day. Thank you!! Oh my goodness how this made my day and my heart soar!! I am so glad you and your daughter are enjoying the scriptures and I hope you both have a blessed month!! I am loving the Scripture Writing Plan. I have incorporated it into my daily bible study and quite time and look forward to it each day. Thank you so much. I love your recipes and stories about your family. I love Mama’s posts also. Thank you so much Vonda!!! Thanks so much for sharing, started doing this with your January post. Thank you for posting them sweet new friend! I love hearing how God is using my tiny works for His good! He is so good! 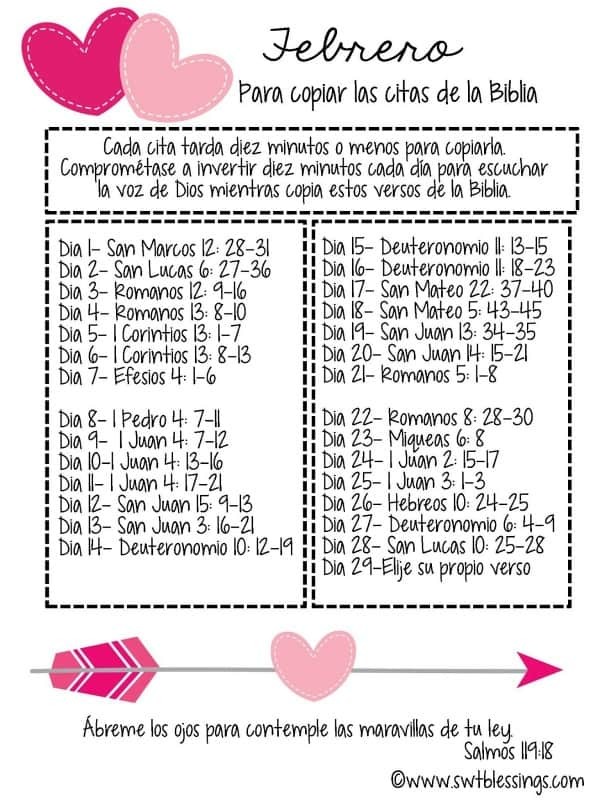 Christy ~ ~ I just love your monthly Scripture Writing Plan. It will be a ‘for sure way’ to get me into God’s word on a daily basis. I’m just getting started, and I’m not sure how long it will take me to catch up, but I’m going to give it much effort. I’m thinking that I’ll try and write 3-4 scriptures a day until I’m on track. Also, I just bought a set of the Family Bible Library on e-Bay. They should be delivered on Feb. 13th and I’m looking forward to receiving them. Thank you again, and Blessings to you and your family. ♥ ~ ~ Judy D.
Hi Judy! Thank you so much, I hope you enjoy!! Thanks for the post. Saved it as my Background on my computer so it is the first thing I see when powering up every day. All of your posts are a blessing to me and I treasure our friendship. I pray for your strength and guidance thru life’s journey. Remember always, God truly loves you, his special daughter. Barbara, I treasure you as well!!! Thank you so much for always encouraging and uplifting me, I hope you have a blessed day my friend!!! 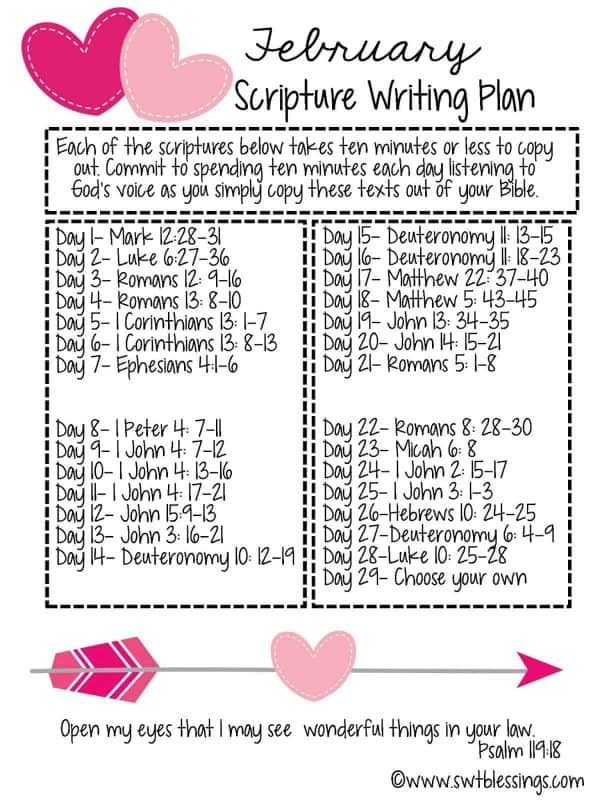 Christy, thank you so much for sharing this scripture writing plan. It has helped me learn verses that I may not have been familiar with. I even shared one at church the other night when the pastor asked us to choose a verse that we wanted to read that related to what we wanted for our nation. Please continue to provide this each month! Thanks again!! I am so glad you are enjoying it Connie!!! Have a blessed day! I needed this plan. I have found over the years that if I write something down I remember it much better than just reading. I have been searching out the scriptures too. We live in a down stairs apt. One night was trying to write and search out scriptures a someone put a video game on rather loud. I put my ear buds I’m with my favorite Christian channel on. I just kept searching but I could still hear game in the back ground. I was getting irritated but kept on going. One of the scriptures was Habakkuk 3:2. I started laughing. I’ll let u look it up. But I look forward t writing down the scriptures every night. Not an early riser and have to be at work early. 🙂 Isn’t God good?!?! May God bless you sweet Glenda!